Personal Articles Floater | Special Feature | BIM Process Update | Webinars | TRIVIA! While today's burglary statistics show an overall decrease in burglary rates, too many homes (roughly 430,000) are broken into every year - most often in plain view, during the day. Business-owned collections are also not immune. In fact, In 2015 property crimes resulted in an estimated $14.3 billion in losses. While there are some criminals that are too brazen, unlucky or both to get away with their crimes, police actually solve only 13% of reported burglary cases due to lack of a witness or physical evidence. Only a small fraction of burgled goods (other than cars) are recovered. While the victims bear the mental trauma and pain of loss, if not physical injury, the financial loss is mostly covered by insurance when it is in place. 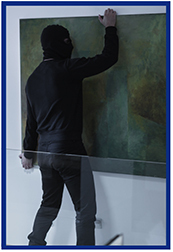 Surprisingly even multi-million dollar art held by museums may not have any theft coverage. Policies are written on an admitted basis. The carrier is rated A XV by A.M. Best. The Personal Articles Floater is available on Big "I" Markets in all states (except AK & HI) for both commercial and personal lines. Have you received yours yet? Or did someone steal your copy off of your desk already? Wait, you spilled coffee on it out of sheer excitement for our dazzling product lineup!? Not to worry! 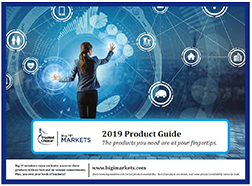 You can view the guide right here online or at www.bigimarkets.com. The guide provides an overview of most markets available on BIM. Our cover this year has the phrase, "The products you need are at your fingertips." And that's just how we hope you feel after reading through the wide array of markets available to you as a Big "I" Markets agent. Take a moment to flip through and perhaps discover a gem you hadn't noticed before. We are here to serve you and hope our product line up continues to help your agency thrive while serving your clients. Based on user feedback and ongoing efforts to improve the Big "I" Markets online experience, additional important enhancements to our platform have been made. Previous updates created a hit ratio dashboard and streamlined interactions. Our most recent improvement is to the Big "I" Markets "Quote Detail" page. A new user-friendly quote detail page will now appear. Instead of one long scrolling page to see details of a quote, sections have been created. This allows for faster and more organized access to information you are seeking. Additional updates will be released in the near future. Please feel free to contact us with any questions at bigimarkets@iiaba.net. Got an idea for an improvement to BIM? We would love to hear about it! We welcome your ideas to help make Big "I" Markets the preferred market access platform. As always, thank you for your support of Big "I" Markets. This session will provide general information about these critical contracts and identify the top provisions to review closely. These provisions include ownership of expirations, post-termination provisions, commissions, carrier communications with insureds, indemnification, and others. This session will take a closer look at how contracts should address issues such as ownership of expirations and post-termination provisions. This session will highlight new provisions that are becoming more common, such as information security and data breach provisions, and cyber insurance requirements. 1. On this date in 1994, a pastel version of this famous painting is stolen from an Oslo museum. Name the work of art. 2. Recently, workers at a Hong Kong potato chip factory discovered something that was definitely not a potato in a shipment from France. What was it? 3. What is the second product listed on page 14 of the new 2019 BIM product Guide? TB - Ten year old Iceland native Brynjar Karl Birgisson took nearly a year to build a 26 foot long, 5 foot tall version of what? It is now on display in a Pigeon Forge, TN museum. Congratulations to our agent in Washington on a Cyber Insurance - Coalition sale of $19,452 in premium!